After a woman was hit by a bicyclist riding on a Sacramento sidewalk, she threatened the city with a lawsuit, and her attorney is pushing the city to pass one of the most restrictive bicycle licensing laws in the country. 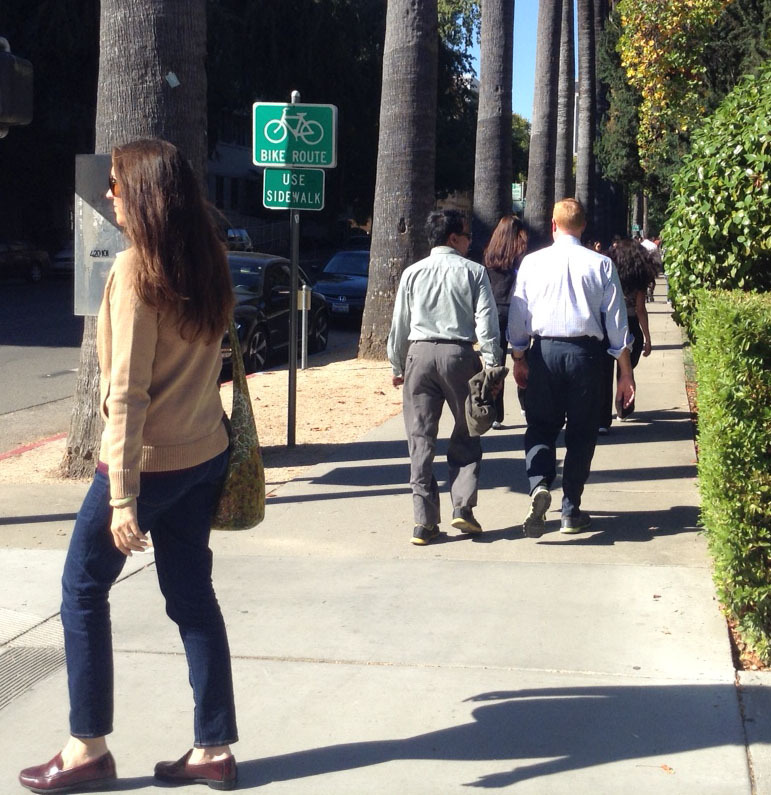 Last Thursday, an attorney for Sacramento Bee writer Hilary Abramson submitted a proposal for an ordinance that would outlaw riding on sidewalks to the City Council’s Law and Legislative Committee. But the proposal went beyond just bikes on sidewalks. It would also have required bicycle riders to buy a city-issued license for $10, take an unspecified test, and register their bikes with the city. Local station KCRA’s first over-excited response to the story was that the committee now had to decide “whether to take this proposed ordinance to the city council.” But the bike regulation idea got no traction at the meeting, and discussion among committee members focused on the original goal of the meeting, which was to clarify the city’s rules on sidewalk riding. Randi Knott of the City Manager’s office, introducing the item for discussion, said that the city’s top goal in updating its bicycle ordinance is to encourage the current growth in cycling in the city. That, several speakers pointed out, is a goal that would not be met if the city imposed a ban on sidewalk riding. Jim Brown of Sacramento Area Bicycle Advocates (SABA) pointed out that unsafe conditions on Sacramento’s street network often make bicyclists feel that riding on the sidewalk is their only safe alternative. Brown also submitted written testimony to the committee, with suggestions for actions that the city could take immediately to address those conditions, including a seamless network of protected bike lanes, better signs, and traffic calming around the capitol, where the designated bike route is on the sidewalk [PDF]. 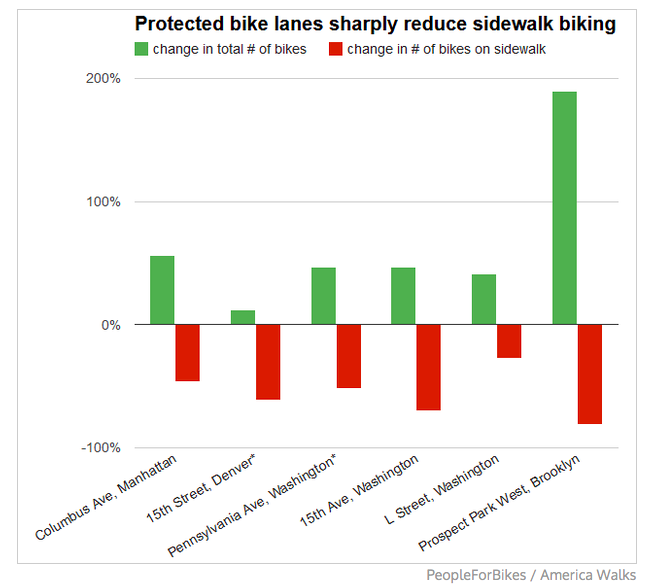 This graphic from Eric Jaffe at Citylab shows the best way to get bikes off sidewalks is by giving them a way to feel safe on the street. The consensus among committee members was that any decision needed to be data-driven. He directed staff to bring back more data about best practices nationwide, and to use the Bicycle Advisory Committee to help come up with recommendations for short- and long-term solutions for different parts of the city, which provide very different levels of safety for bicyclists. KCRA toned down its response on Friday with an interview with committee chair Schenirer. The plan is for committee members to with pedestrians and bicyclists, including WalkSacramento and SABA, the traffic division, police department, and planners over the next few months to discuss “how best to make it safe for everyone,” according to Schenirer. At the end of January, the committee will make recommendations for a new bicycle ordinance through the City Council. When my roommate, Zach Watson, was killed by a driver while walking on the sidewalk in SF earlier this year… no one talked about changing any laws for drivers. And when bicyclist Tom Thompson was hit and killed by a car while riding (lawfully) in the bike lane on Freeport Blvd. in Sacramento on 9/18, nobody on the City Council called a special public hearing on making conditions safer for bicycling. That’s what happens when the victim isn’t a retired newspaper reporter with excellent City Hall connections. I’ve got a simple solution – make some streets bike only! Less conflict with angry driver AND pedestrians and those of us that want to improve our health and help the planet don’t have to be threatened or bothered by either! Maybe then more people will ride (because it is safer – I know many who don’t for this reason) and we can then have MORE streets just for bikes and walkers (obviously bikers would not have to go up on sidewalks if it was not for cars). Wouldn’t it be great if – for once – Sacramento got ahead of the curve on something like this! I can’t believe people actually complain so much about something like cycling that is so healthy and good for people – yes, accidents will happen, but really – get out of your big SUV’s and ride people. It will make you happier and healthier!!!! Mandatory registration of bikes sounds like it might help with the bicycle theft epidemic. Chop shops operate openly in San Francisco, in part because none of the bikes are registered and so the police can’t do anything. The rest of the ideas proposed here are garbage. …Or submits a claim to the CIty for $3.6 Million. I really doubt that registration will reduce bike theft because the chop shops will just strip the frame from components and toss the frame. Or grind off the serial number. The police department doesn’t have the staff to track down and arrest people who may or may not be in possession of stolen bike parts. You have to catch the thief red handed. This is well debunked. My theory on reducing bike theft would be a dedicated police program of honeypot bikes. Shouldn’t take very long to discourage most casual bike thieves. This is more likely to work well in a smaller town without a big stolen bike market. Hahaha, that’s a good one. I mean, truly, yes, an obvious and good idea. But have you heard about the war on cars? Its this imaginary thing that drivers freak out about when they don’t get a full 100% of all transportation funding. Just imagine if they also didn’t get to drive on a full 100% of streets. Has the driver been charged in that case yet? Ah yes – because there are SO FEW streets and highways for cars to drive on! ;-) It’s just so horrible how car oriented our society is isn’t it?!!!! And I’m not just talking about bikes, I’m talking about our lack of good public transportation. Anyone who has ever been to Europe knows about how amazing their train system is (goes everywhere and anywhere!). We are so missing the boat in the U.S. It’s so stupid. As you can see by the lack of support – your idea is the only one that is garbage – LOL! It’s not my idea. I just know police in San Francisco who are frustrated that they can not do anything about bicycle chop shops because no one has their serial number registered. It would be better if bike stores registered serial numbers of bikes they sold. If you don’t have the serial number of your bike when it’s stolen, you have no recourse. The police I’ve talked to who care about bicycle theft say it would be a great help if everyone registered their bike’s serial number: http://www.safebikes.org/ The police can arrest you if you are in possession of a bicycle with the serial number stripped off. boo hoo. No difference than keeping your own serial number in your records. And police forces that are continually being cut back are never going to devote resources to such things. Stupid garbage idea. .
It’s not PC on this list, but as a pedestrian I find bikes on the sidewalk to often be scary. My ability to walk is perfectly fine, but I find that bikes on the sidewalk often come extremely close to me. My experience is that some sidewalk riders respect my right of way, most don’t. I don’t think that bad conditions on the road justify riding on sidewalks in busy areas, they justify making roads work for various modes. But if there’s a problem on the sidewalk, I’m not allowed to walk in the middle of a busy road. The PD says it plans to refer the case to the DA for charges of vehicular manslaughter, but I haven’t seen anything happen with the case yet. This is annoying and often dangerous. Only children are allowed to ride on sidewalks most places. This seems like a no brainer. Bikes ridden by anyone other than little kids and their parents belong on the street. area or on a sidewalk that is marked as an established bike route. Bikes belong on the street and they need to take control of a lane if necessary to feel safe. Car drivers must get used to their presence. As a rider and a driver I have found one rule that works all the time “Do not TAKE some one else’s right-of-way. So, SF would qualify as a “big city”. The city I live in doesn’t have this problem. That being said, I don’t think bike registration has ever proved useful either, and in many cases, has proved the opposite. The main reason for not having separate streets for motorized vehicles and bikes is that what ever vehicle I’m in I’m allowed to get to any destination on any public thorough fare. So restricting the thorough fare for any user is not going to work.